In 2017, seventeen named storms caused $202 billion in damages. Hurricane Harvey, by far the most damaging storm to hit the U.S., caused $125 billion in damages over 28,000 square miles in the Houston area, pouring more than 50 inches of rain over six days and displacing 32,000 people1. Soon after, Hurricane Irma hit Florida, causing $50 billion in damages and Hurricane Maria hit Puerto Rico and other Caribbean islands, generating $90 billion in damages2. The 2018 hurricane forecast promises to be equally damaging. Colorado State University’s forecast calls for 14 named storms, which include seven hurricanes and three major hurricanes3. Major storms’ long-term impact on local economies can be devastating. According to the U.S. Dept. of Labor, almost 40 percent of small businesses never reopen their doors following a disaster4, largely because of the high cost of repair or replacement. Another 25 percent fail within one year of a natural disaster. Those who do stay in business are often left scrambling to find contractors, engineers and consultants to assist in the assessment of damage and remediation of their facilities. To further complicate matters, prices can spike during a natural disaster because of increased demand for services. Large storms significantly impact communities for months and even years. From electricity and water services to fixing roads, repairing the infrastructure to return a community to normal is staggering. Lack of preparedness contributes to the high failure rate of businesses experiencing a natural disaster. Businesses in the coastal community stand a better chance of surviving after a storm if they have disaster recovery and business continuity plans in place prior to hurricane season. The following six steps outline content needed to create a disaster recovery and business continuity plan. Step 1: Appraise the Danger. Water damage is frequently the largest concern during a hurricane. Water damage is pervasive, creeping into every crevice and corner and leaving nothing above the waterline safe. When there is water, there is also mold, which can cause serious health concerns if not handled properly. Whether the property is flooded or not, it needs to be assessed for moisture damage after a hurricane. Step 2: Evaluate Environmental Hazards. Water damage to building materials can create an environment that promotes biological growth, especially mold. Other common environmental hazards that can occur during a hurricane include the discharge of materials such as asbestos, lead paint, polychlorinated biphenyls (PCBs), hydrocarbons and oil. The disaster recovery plan should establish a method for safeguarding chemicals, mechanical systems, fuel storage units and equipment. The plan should also ensure that systems are designed to resist wind loads and develop solutions for protecting vital systems by moving them to a higher elevation or securely anchoring them. Should hazardous items leach into the environment (soil or water), building owners are required by the EPA to perform specified remedial actions including material disposal, which increase the cost of recovery, both in terms of time and money. Step 3: Consider Business Continuity Implications. Staffing: Define the chain of command and crisis management team. Address whether employees are able to work from home and what to do if they have no power. Be sure to include how and when they will communicate with one another. Outline critical operations and how they will be performed during the storm, as well as items that can be delayed until the crisis is over. IT: Ensure the technology required to keep operations is running and how to proceed if systems are offline. Crisis: This plan includes both internal and external audiences. Creating and communicating a plan to your employees and customers will ensure everyone is on the same page during the recovery phase. Establish the message you will be sending customers and the communications channels that will be used. Consider telephone, email, internet/intranet and texting. Employee: Determine your policies for emergency leave while employees recover. Identify any employee assistance measures you will offer and whether employees gain access to this assistance via HR or a third-party6. Step 4: Perform Pre-storm Tasks. The Disaster Recovery Plan should contain tasks to complete before the storm hits that will minimize property damage. Below is a list of mitigation efforts that can be completed by a professional landscaper, tradesman or engineer prior to the storm. Reinforce signs to withstand wind and rain. Manage landscaping. If your property is in a hurricane zone, consider implementing hurricane resistant landscaping, including removing large trees that could damage your property. Ensure fencing is properly installed. Relocate critical building contents at least one foot . Create emergency service agreements with qualified contractors and consultants prior to a disaster. Establishing a scope of work and protocol for remediation will save time, control costs and ensure the work is conducted in accordance with local regulations. Insurers are valuable resources in developing these plans and can offer post-storm advice and trusted vendor information. It is especially important that building owners and insurers have an environmental professional under contract to conduct a Moisture Mapping and Hazardous Materials Assessment immediately following events. Reputable firms will have specialized equipment such as moisture meters, XRF lead detection units and infrared units that look behind the walls to find moisture and mold damage. These firms will provide insurance companies and building owners with accurate damage assessment reports, including hazardous materials contamination. Experienced field technicians or engineers perform these evaluations quickly and efficiently so that recovery can get underway. Hard copy documents are a liability, especially in the chaotic time following a natural disaster. Save items such as building drawings, insurance policies, emergency phone numbers, logistics plans, and vendors information electronically. Store documents in the cloud so they can be accessed remotely. With a plan in place, recovery happens more quickly and efficiently. The first step in recovery is to accurately determine the damage done so that insurance payouts can be properly calculated. 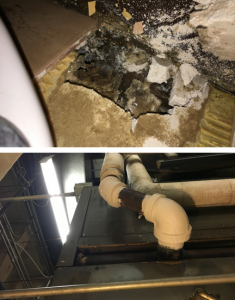 A comprehensive assessment will identify the scope of damages and create a remediation protocol that addresses all structural, water and mold damage. Having established a scope of work and a protocol for remediation, the owner can control the costs and ensure the work is done properly. By having contracts in place prior to a disaster, you reduce the timetable of recovery and avoid being taken advantage of by inexperience or unethical contractors who prey on disaster victims. In summary, hurricane seasons will continue to challenge coastal Americans. Protect your business for the long haul by creating a comprehensive disaster recovery plan to enable you to get on your feet more quickly and with less hassle. Keith Savel serves as Vice President of Client and Business Development for NV5, specializing in disaster recovery services. Keith has spent his career advising corporations on how to manage complex environmental concerns, including hazardous waste disposal and hazardous materials remediation. Keith has a degree in Chemical Engineering from Tufts University.